This is a list on many of the items in my collecton related to the marketing of typewriters, office machines and supplies. I'm not offering these for sale, though some of the items, not all, may be avalible to be photocopied; it depends on how busy I am at the time. Instructions for Operators: Burroughs Computing Billing Machine, Style 720301, February 1940 - includes"Table of Chain Discounts" (March 1945), missellanious worksheets and an operator test (June 1941). Vol. 3No. 12. January 1916. Featured Topic: Latest Model 10 Remington. Vol. 4No. 4. May, 1917. Featured Topic: Self Starting Remington. Vol. 5No. 4. Spring, 1924. Featured Topic: Remingtons in action. Vol. 5No. 5. Autumn, 1924. Featured Topic: Dedication of Monument to Christopher Latham Sholes. Vol. 5No. 6. Spring, 1925. Featured Topics: Noiseless No. 6 & Charles E. Weller, The Origional Typist's Obit. Vol. 5No. 7. Autumn, 1925. Featured Topic: The MacMillam Arctic Expedition & New Bookkeeping Machine. Remington Rand Ink. Vol. 3No. 10. March, 1948. Featured Topic: Labor unions, communism and a new electric adding machine. What Every Typist Should Know, July 1935. Mechanical Instructions for Remington Model 17, August 1942. An easy guide for operating the Remington Portable Typewriter. Instruction book for Remington Portable Typewriters and Touch Method typing, 1946. Remington Rand tough method typing Instruction Book, ©1951. Royal News, Edited by Stanley C. Mason. October, 1954. Royal News, Edited by Joseph G. Fogarty. October, 1955. 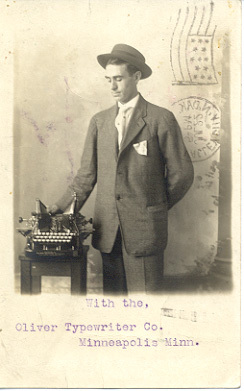 How to use Corona - The Personal Writing Machine (3-bank, folding), 1910's. How to Use Corona - The Personal Writing Machine (Domestic) (3-bank, folding), August 1918. Instructions for Operating CORONA FOUR, a Portable Office Typewriter. How to use Corona - The Portable Typewriter (4-bank, non-folding), 1930's & Tough Typewriting Chart ©1925. How to use Corona - Floating Shift Models, April 1938. Tough Typewriting Chart ©1925, printed in June 1937. Corona Portable Adding Machine ad leaflet, August 1937. Instruction manual for Smith-Coraona Portable Typewriter, July 1955. A LESSON IN OPERATING The L. C. Smith & Bros. Typewriter, Form 568, 1920's. Operating Instructions for the NEW Super-Speed L C Smith, 1940's. Parts Book for L C Smith Typewriters Model Eight, also Ribbon Indicator model and Super Speed model (Standard and Silent), Origional and revised portions ranging from April 1, 1930 to September 1, 1939. Tips to Typists from SCM, 1948. UEF news, Edited by Andrew Cerruti. September, 1942. Instructions for using The All Engish Model 21 Bar-Lock Typewriters, made in Nottingham, England. Friden fully automatic calculator Model "ST" Operating Instructions.